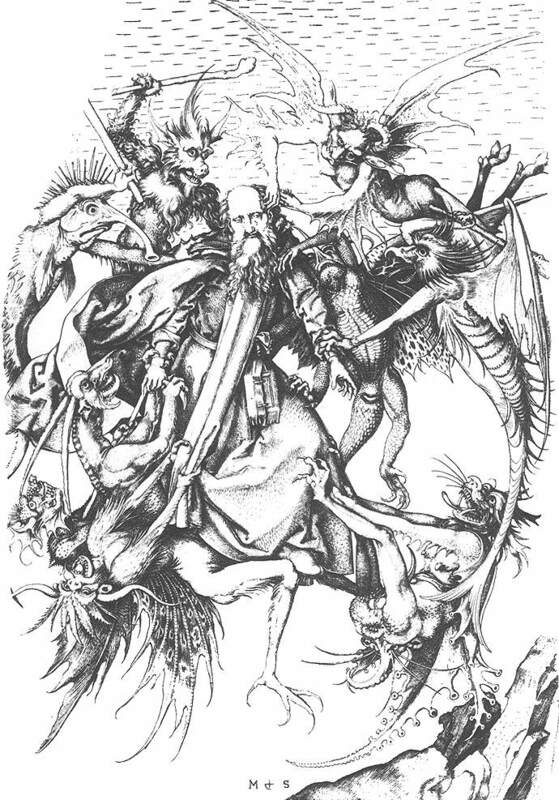 Many of you have seen a popular depiction of a knight slaying a dragon, or the archangel Michael slaying a demon, or the Hindu goddess Kali piercing demons, etc. It’s a popular theme that can be seen in many temples, churches, paintings, and so on. 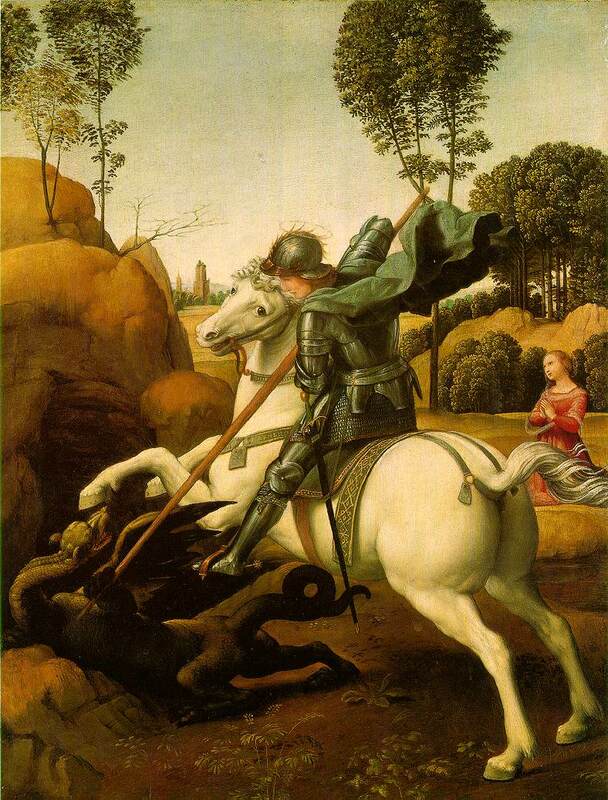 One of the most recurring depictions is of St. Georges killing a dragon, and rescuing a damsel that is always nearby the battle, trapped by the dragon. There is truth behind this mythological depiction. It represents the spiritual part of us (St. George) fighting our own inner darkness (the dragon), and when it overcomes it, another pure and spiritual aspect of us (damsel) is freed. As mentioned in my previous post, The Spiritual Path to Awakening, there are 3 keys to awakening: death of the egos, alchemy/white tantra, and sacrifice for humanity. Egos are subconscious energies that are part of the animal kingdom, and which are now “attached” to our psyche. 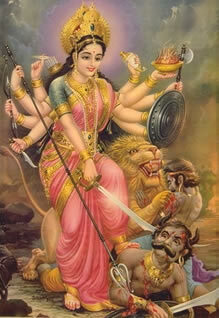 These are the energies such as lust, pride, anger, gluttony, fear, anxiety, depression, jealousy, and many others. Our psyche is compromised of three parts: consciousness, subconscious (egos) and personality. What we are is consciousness, that which is aware and awake. Unfortunately, humans generally have only 3% of consciousness; the other 97% is trapped within the egos. This means that we have 3% of consciousness and 97% of egos. Due to this, we are often not aware of ourselves, nor the world around us. We spend a lot of time in daydreams, which are egos as well. They are compulsive energies that disguise themselves as us, and they go on getting what they want. When they manifest, we identify with them and we think that it’s really us who want to have this or that, but with self-observation we can see the emotion and/or compelling mental thoughts that are driving us to do something, like for example having a drive to buy something. Since our consciousness is still so small, our will to make fully conscious choices is minimized, and thus we are mostly governed by subconscious thoughts and emotions. Most emotions that we feel are coming from subconscious ego emotions. Both pleasurable and painful emotions are egos. We have only a tiny capacity to feel true spiritual feelings, such as love and compassion. However, the more we progress in this spiritual work, the more we replace these inferior emotions with superior ones. Many are afraid to die to their egos because they think that there will be nothing left of themselves. That is because they identify themselves with the egos and do not understand that they are not their egos. The way to truly understand it is to practice awareness and self-observation. Then you will know who you are, and will see egos like clouds that come and go, that are impermanent and are always changing. We are not our thoughts either. They are of the mind, and we have ability to consciously use our mind and to think when we need to. However, egos in the intellectual center come into thoughts and are constantly manifesting as various images and thoughts. There are dozens of thousands of ego-initiated thoughts per day. “I want to read a newspaper”, “No, I’m bored by this, I want to do something exciting today.” “But I fear that something will happen to me, I would rather go and watch TV.”, “Yes, TV will relax me, but I think I’m hungry.”, and so such drives, impulses, images, opinions, etc., repeat endlessly throughout the day, often contradicting each other and making our lives miserable. The death of the egos technique is, together with alchemy, known in many ancient spiritual civilizations as a key to reach Divine. It was taught by many spiritual beings, such as Buddha, Jesus, Krishna, Zoroaster, Lao Tzu, and many others. In ancient texts this was known as the inner death, the mystical death etc. “Watch” is to self-observe and spot egos, and “pray” is applying the death to the egos that we have spoted. When we spot an ego manifesting in any of our five centers, we ask our Divine Mother (the female aspect of our own Being) to eliminate it (you can read more about higher aspects of ourselves in my previous post). For this to work you need to have understanding that you are not your egos and that you are that which is aware – that you are consciousness. You also need to have intention for the ego you spot to be gone. Application of the first key is done in every moment of the day, because egos manifest constantly. When you spot an ego in any of the centers in the body, you mentally direct you petition to your Divine Mother: “Mother, disintegrate/kill it.” The more you do it, the faster you progress. When you apply the death to, for example, a random thought, that tiny ego is eliminated and consciousness that was trapped in it goes back to your main consciousness. This goes for the death of every ego. For a tiny details of egos it’s enough to say the petition just a few times, but for anything larger than that you have to apply the death continuously until you are clear of it. If you do this properly and consistently, your consciousness will increase, bit by bit, percentage by percentage, and that will change your entire life. Your entire visual perception will increase, you will see the illusion of this dimension, you will see more depth when you watch into object (not just the mere image of it), you will start feeling love and compassion for everyone, the ability of astral projection and waking up in dreams will increase, you will have inner peace and silence, and much more. This is the foundation of true spiritual progress. You cannot achieve true spirituality within if you don’t die to your animalistic ego energies – they are incompatible and of different substance then your soul and your Being. You have to choose either one or the other – you cannot have both. It’s not easy to wage this war against egos, but it’s the way out of this inner mess that everyone is in, and into the peace and love of the Spirit. If you want to explore this exercise, it is advisable that you first learn how to be aware of external world and internal world. I also recommend reading and practicing exercises from Belzebuub’s free ebook Self-Knowledge for Spiritual Awakening. Another great book that is helpful for getting more understanding about egos is Revolutionary Psychology by Samael Aun Weor. Also, many of Belzebuub’s students are giving free spiritual courses both online and in person all around the world, all of them presenting these exercises in a structured way. If you are close to any of the groups, I recommend you check them out because it can be very beneficial to practice with other people. Practicing online with others is an alternative to that, and can also give strength to shake off the sleepy pull of mundane life. Wow. So much important info here and so many great reminders. Exactly what I needed to read! I didn’t realize that the ego shows up as emotions, something important to contemplate. Thank you. Jilllurie u r a damsel.In order to emancipate you i must kill the Dragon of negative emotions. Glad it helped. Yes, ego uses our body through the five centers. Many are not aware that tension is also ego manifesting in the motor center. Generally, every sensation in the body is ego. I say generally because on rare occasions people can feel love and some higher things, but that is of completely different nature.